The aim of the "Functional Magnetotherapy" project (FMT) is to investigate a magnetic method that is as gentle as possible, highly localized and allows non-invasive substances from the cerebral blood vessels to penetrate into the brain parenchyma. In particular, the safe and effective parameter space for BBB-opening and tissue heating is to be identified in a model. Nearly every drug therapy for a disease that originates in the brain is faced with a particular challenge: The highly specialized structure of intracerebral blood vessels hinders the effective distribution of drugs to their desired location in the brain. In contrast to the rest of the body, blood vessels that supply the brain with nutrients have a structure that only allows extremely selective access to the brain parenchyma for a few substances: The blood-brain barrier (BBB) consists of endothelial cells, which together with pericytes and astrocytes form such a dense boundary layer around each blood vessel that only very few, usually very small molecules can pass through them. However, this prevents the penetration of cytostatic drugs, which are systemically applied and have a good effect elsewhere, so that brain tumours are particularly difficult to treat and have a very poor prognosis. In addition to a mechanical opening of the BBB, it has recently been shown as a new therapeutic approach that its permeability can be changed reversibly and temperature-dependently. 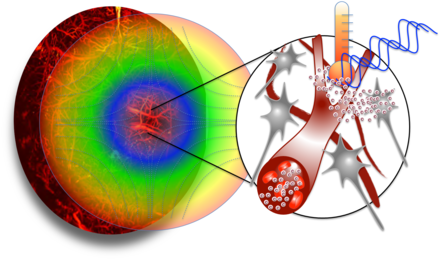 Mild heating reduces its blocking effect, whereby the necessary few Kelvin can be achieved by electromagnetic excitation of magnetic nanoparticles (MNPs) in the bloodstream. At the same time, these MNPs can also be used for Magnetic Particle Imaging (MPI). An MPI scanner now allows not only the targeted visualization and tracking of systemically injected magnetic nanoparticles, but also the limitation of tissue heating to a precisely controllable area. MNPs can therefore not only be used for imaging purposes, but can also deliver heat to the tissue through an alternating magnetic field excitation. The aim is to heat capillary vessels in which the nanoparticles are washed up to an unprecedented level of precision and open their BBB reversibly. In combination with this focused and non-invasive opening of the BBB, other substances such as cytostatic drugs can penetrate into the parenchyma for a short period of time until leak tightness is restored. Illustration of the concept of BBB opening with MPI.